Fruit Spotlight, Err, Harvest spotlight! There are hundreds of varieties of pumpkins out there. Big, small, red, green and even purple! Spookley’s story isn’t far off from the truth! With that being said, Pumpkins are a very thirsty plant, and I mean VERY thirsty. Here in the Kern County, it can be difficult to manage what plants get what water, so we’ve decided to give other farmers just like us the opportunity to have their pumpkins adopted by families in Kern County. Now, we grow a nice little selection our self, but we invite other farmers to send off their unique pumpkins for show at the Big Red Barn! The Racer pumpkin gets it’s name from it’s quick harvest time. They tend to be about 10-12lbs, with a uniform size across the entire picking. A little known fact about the Racer is that it’s resistant to a terminal plant infection called Powdery Mildew. While you may never know it, plants that resist these types of diseases are a boon to farmers like us! The Prankster pumpkin is often called a “personal” or “cannonball” pumpkin, due to their small size. These are the pumpkins that we give away at our Pumpkin Craft during October Fun Fest. They have a very firmly attached stem which makes them easy to pick for us, and fun to decorate for you! What’s a pumpkin without a stem? Most people never consider how carefully pumpkins are bred to get that perfect Halloween look! The Baby Boo is the most adorable little pumpkin. Can you guess how it get’s its name? We’ve always been a big fan of multicolored pumpkins, and these little guys don’t require the massive amount of water some other exotic varieties need, making them a perfect fit for hometown growing in our little valley! Now, these little guys come down from farms all around just to be adopted by people from Kern County, and grow up and be the worlds best Jack o’ Lantern. These little guys have as much character as their journey is long, so withour further ado let me introduce them! The Big Mac pumpkin does exactly what it says on the sign - it bigs! These guys are simply Really Big pumpkins. They can be eaten and prepared the same ways as other pumpkins, but they’re not often chose for that purpose as the skin can be rather fibrous and unpalatable. You’ll never find a cooler Jack o’ Lantern than one made from a Big Mac! 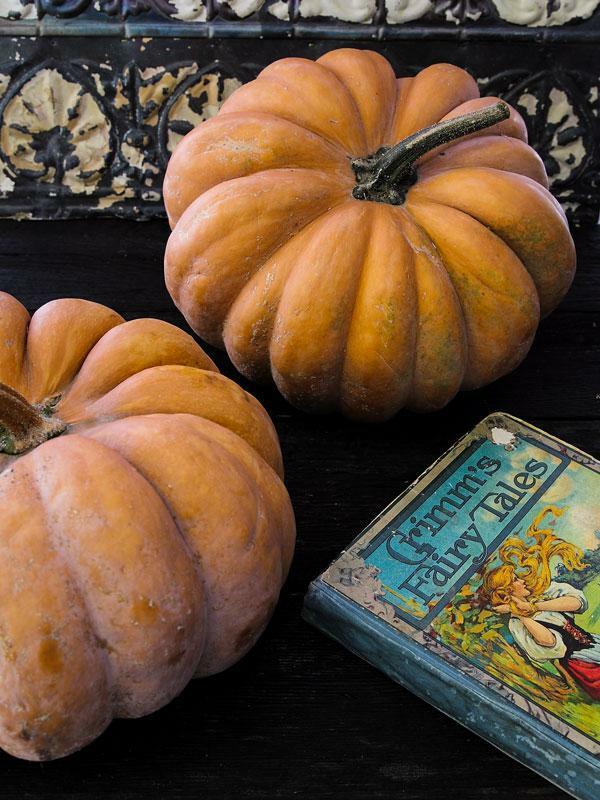 The Fairytale pumpkin comes in a huge variety of colors, but maintain the whimsical shape that gives it it’s name. Whether they be White, purple, or classic orange the fairytale is the end all be all of fall decoration! If you see a pumpkin that looks like its’ about 10 minutes from turning into a carriage, you’ve got yourself a fairytale! The Knucklehead pumpkin is very much like a Bumpy Toad (Another variety of pumpkin!). It even develops with dark green streaks. These are just perfectly ready to be turned into a spooky witch or a funny faced Jack o’ Lantern with a whole bunch of character. Now when you see one in the fields you can proudly say that you’re a certified Pumpkin-ologist! Back in the olden days, every pie was a pumpkin pie. Seriously! The pumpkin shell was the premier pie crust. The idea of using the pumpkin as filling didn’t come around till later. We’ve definitely progressed to a whole new level of pumpkin eatin’ these days. While so many poor old pumpkins will see the end of their days being scooped out and dressed with funny faces, those gooey pumpkin insides could be used to make some seriously delish dishes. Here’s a couple of our favorites! Pumpkins were originally used primarily as a pie crust, not pie filling. These early pies must not have tasted very good, Using a pie as filling was considered strange at the time. It seemed even more strange to the Native population, as they dried their pumpkins into floor mats! Female pumpkin flowers are only in “Bloom” for four hours of the day. If not pollinated then, the flower will accept no more and whither away. It’s a very stressful four hours for the bees in that area, we’re sure. Watermelons and pumpkins are both 90% water! It’s amazing what 10% can do, but they’re more the same than different! We oughtta have watermelon pie in summertime!